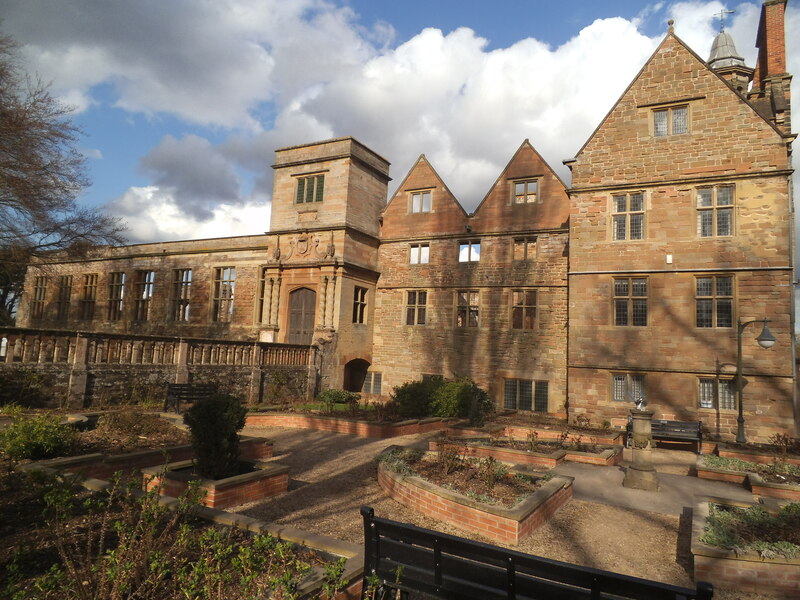 I have just got back from a lovely weekend at our first multi – bash event of the season at Rufford Abbey multi period event which meant catching up with some old friends and making some new ones. The Saturday evening entertainment was a disco in the undercroft (cellars) of the Abbey which meant dancing with lots of re-enactors from Romans to 1940s, it was one of those slightly surreal moments that can only happen in re-enactment. It has been very cold – we had the most spectacular hail storms on Saturday morning and the nights were really cold. Ellie had ice on the inside of her tent last night. This bad weather may have contributed to the fact that I have had a very sore throat and lost my voice so huge thanks to my lovely friend Kerry for driving me all the way home tonight rather than me catching the train. 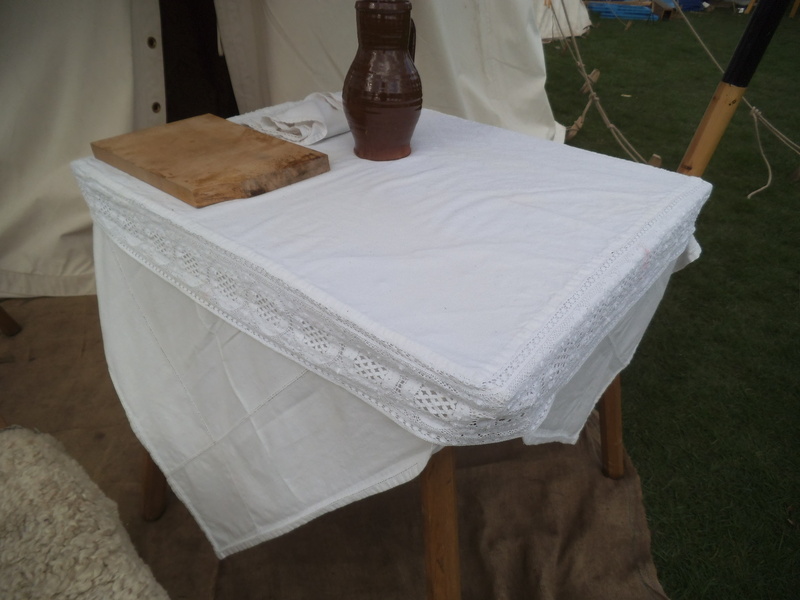 It was a really great display and I have taken some pictures of the Abbey and the encampments below. 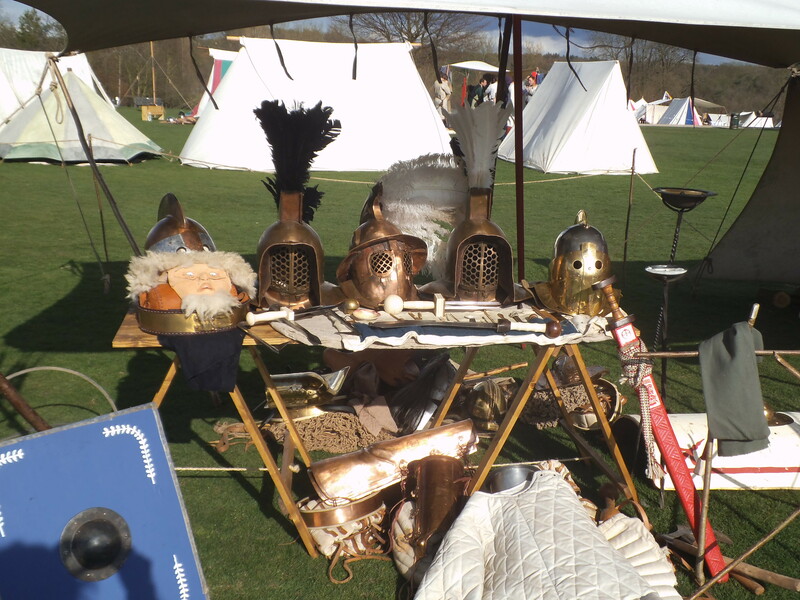 I love looking at other group’s displays and this one from Comitatus who cover the late Roman period was amazing – look at those helmets and that dragon flag! 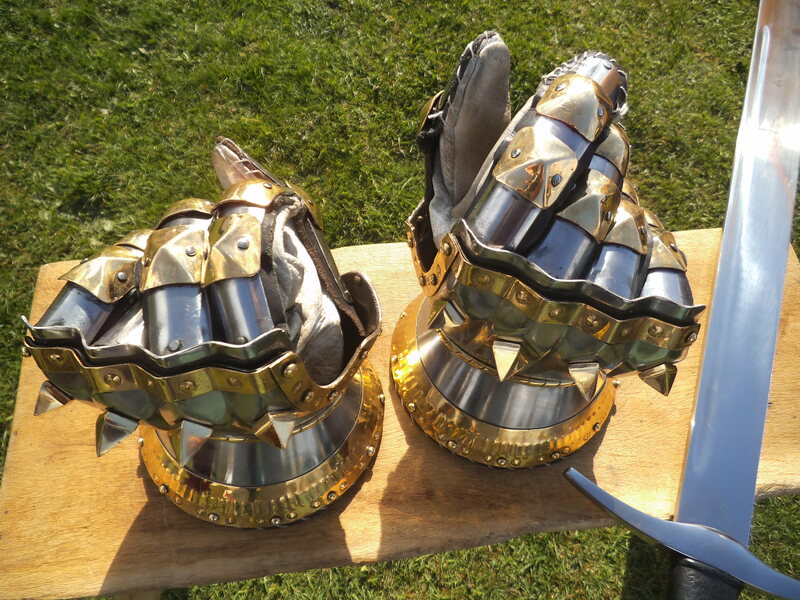 The boys from my group, Swords of Mercia, have been busy buying and making new things and these are Luke’s new gauntlets – he added the studs himself. While wandering round on Saturday evening taking pictures we met a very lovely lady called Maxine from the Bowden Retinue. 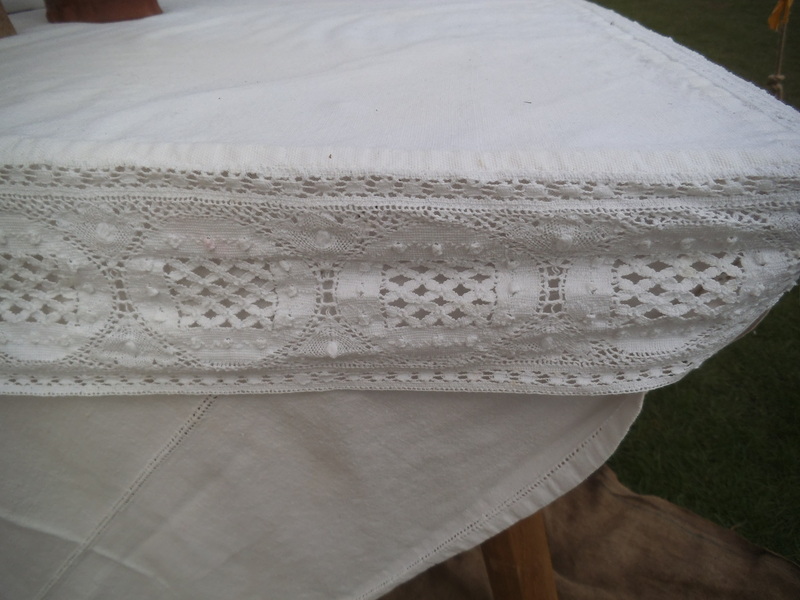 I had stopped by her tent to take a photo of her tablecloth and when she came out she was kind enough to tell me where she got the lace from (it dates from the 1620s) and how she had made the tablecloth and also showed me some more of her embroidery. I do love chance meetings with people that share my interests! 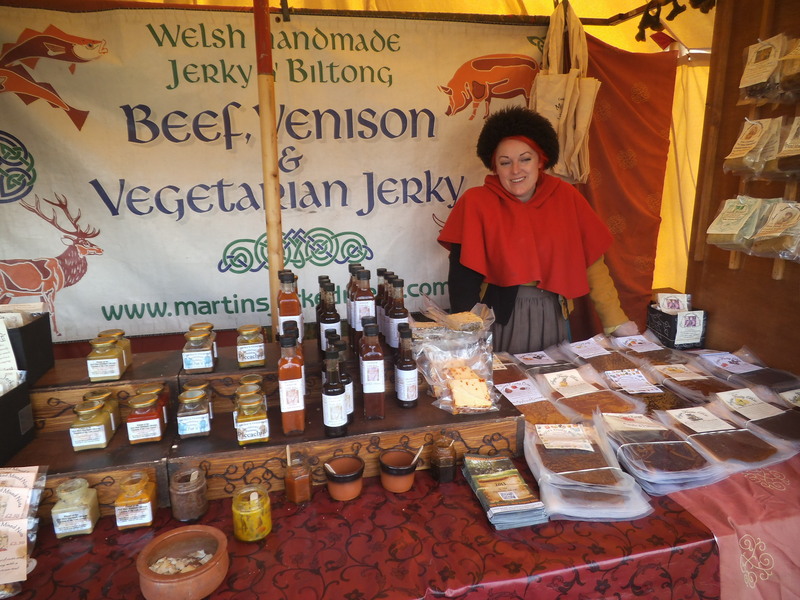 I also bought some lovely relishes, chilli peanut butter and cheese from my friend Suzi’s stall, she and her husband make the most marvelous things and do mail order – go and look on their website Cowleys Fine Foods. I am looking forward to next weekend when in will be away at an event in Sherwood Forest, there may be some outlaws lurking in the woods so we will have to be careful! 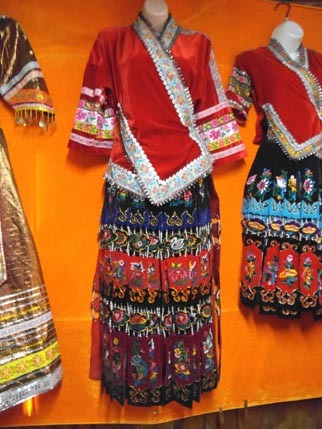 It is Spring – let the season begin! 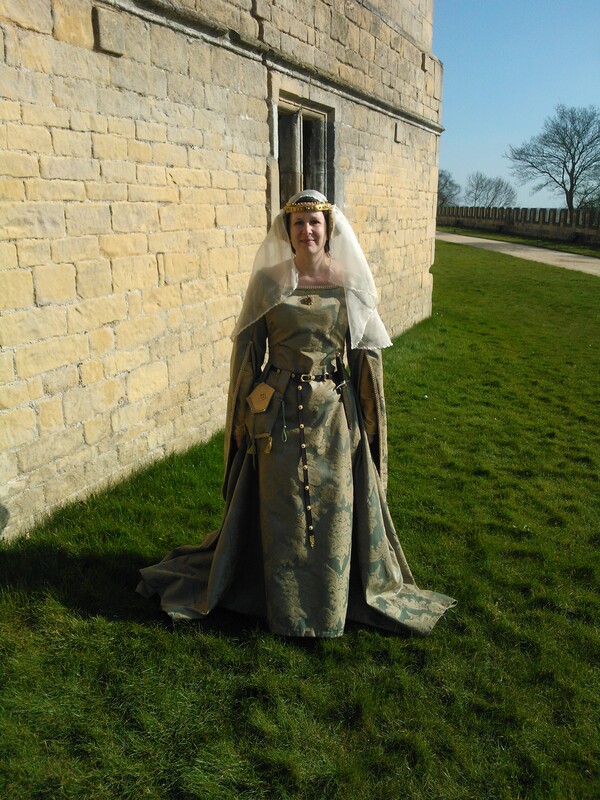 Hello everyone, I do hope you are all enjoying fine weather, we are having a lovely time – the Spring flowers are blooming, the weather is sunny and finally the re- enactment season has begun. I am a very, very happy bunny!! 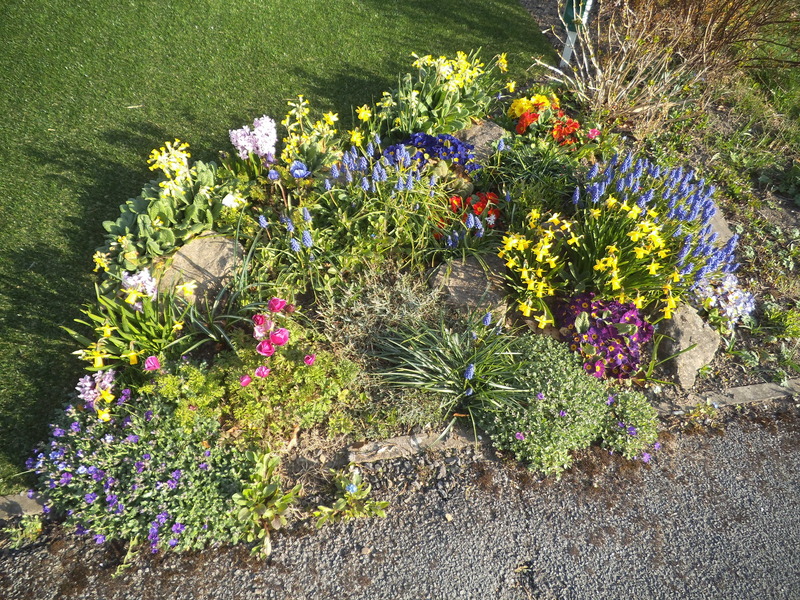 This beautiful pic was taken outside Kerry’s house this morning, her neighbour has the loveliest display of flowers. Mine are doing very well, surprisingly they have survived the near constant snow since they were planted and I have some daffodils, crocuses and tulips coming out. We had our first event this weekend, I was only able to join the group for today as I had to work yesterday but we had a really great time. Today was a bit windier but very good and we had a really nice time doing our St George’s Day event. 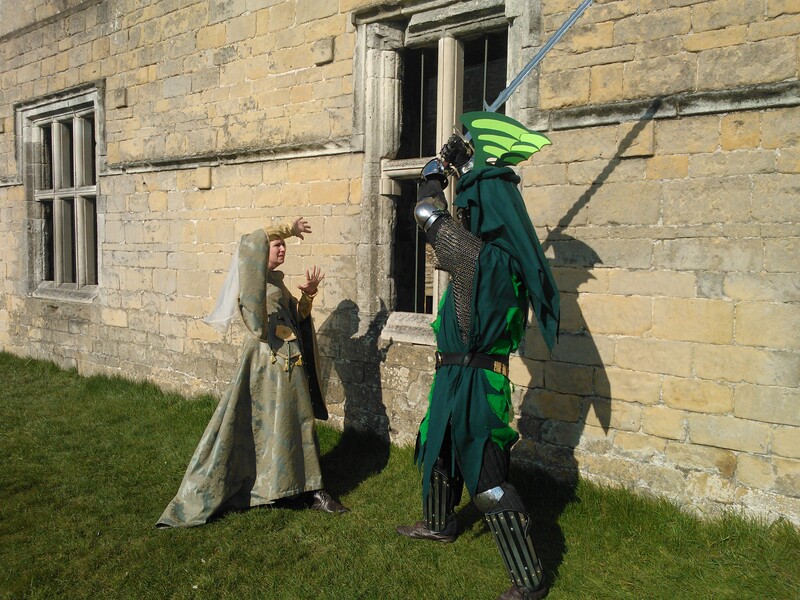 Here is Kerry in her beautiful dress in the sunlight at the castle and later being scared by the fearsome Dragon Knight – aka Mark in a very impressive helm that the guys had made for the event. I now have events for the next two weekends so I am really looking forward to lots of fun, catching up with old friends, sitting round the campfire and mellowing. 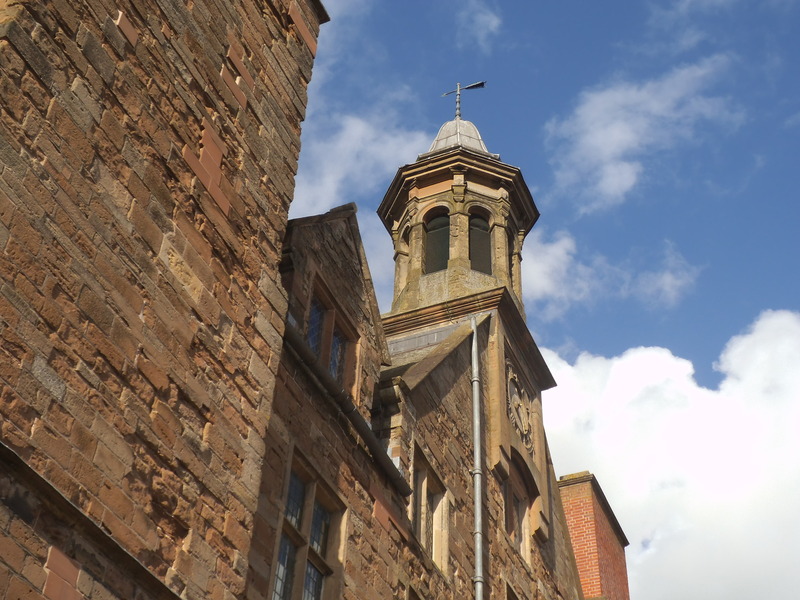 If you want to join us we will be at Rufford Abbey next weekend. Well the snow has almost gone here in Yorkshire apart from bits on the hills, we have Spring flowers appearing and have had a couple of warm days recently so we are all feeling very happy! 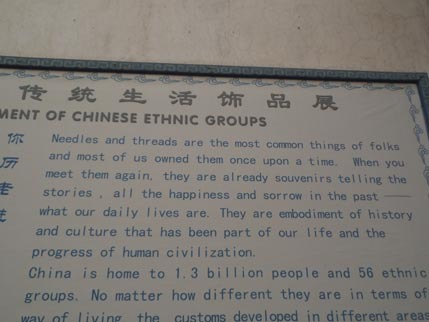 One of my favourite parts of the China Nationalities Museum that I visited while in Beijing was the exhibition of needlework, this sign outside perfectly captures how I, (and it would seem the museum organisers), feel about stitching! 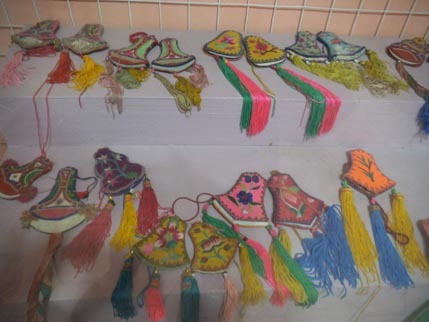 There were themed displays of footwear (including the very sad lotus feet shoes for bound feet), bags, headwear and gifts – these little embroidered tokens of love and affection are called henbao. 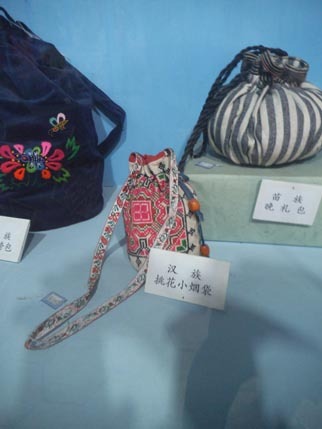 I was interested to see cross stitch and patchwork in the bags as well as the more traditional Chinese silk embroidery. 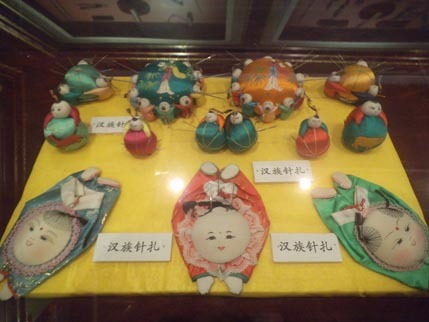 There was also a section devoted to needlework tools – anyone remember these pincushions at the top of the photo? 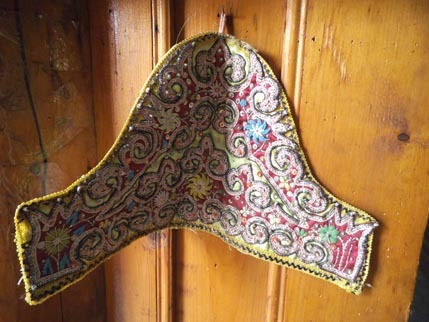 My Nana had one when I was little (as well as the tomato one with the strawberry emery attached). 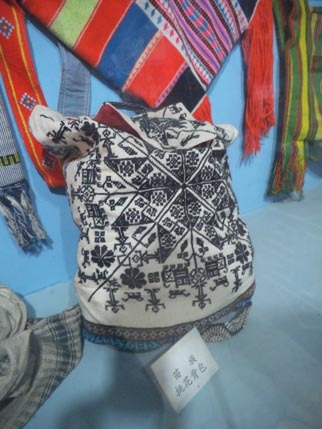 In another part of the museum there were some displays of traditional Miao people costume, with beautiful silver headdresses and embroidered robes. 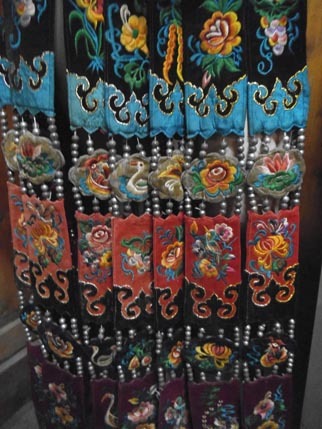 Each strand of the skirt is a separate piece joined with silver beads. 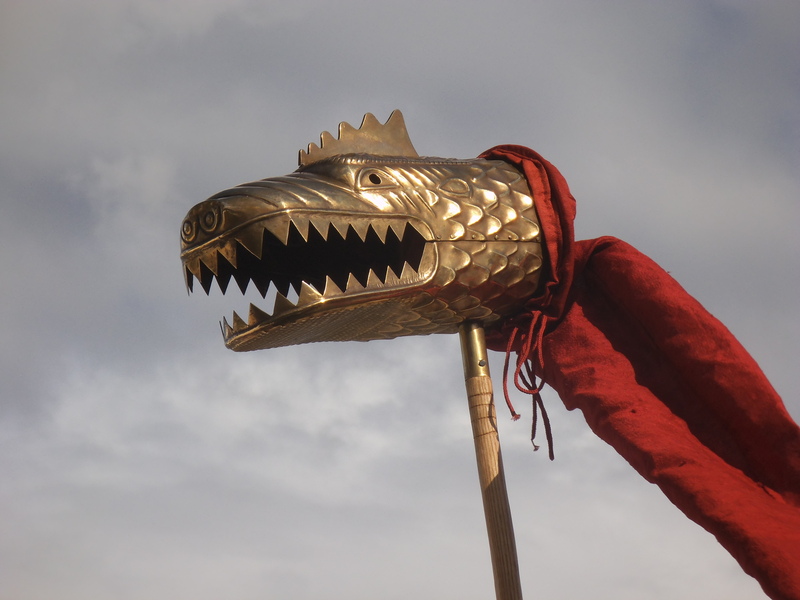 I must get around to putting up the events page for this year but next weekend we are at Bolsover Castle in Derbyshire – on Sat and Sun celebrating the victory of St George over the evil Dragon Knight! Please come and join us if you can. As promised here are the pictures from Spain. 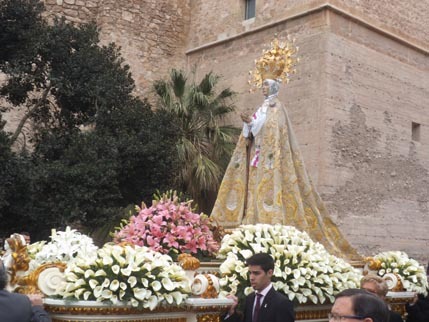 This year we went to see the Easter parade of icons in Elche, a beautiful town just a short distance from my Mum’s that dates back to Roman times. The cathedral here is one of my favourites and I have posted pictures of it before here. The parade was of two of the life-size icons, Jesus and the Virgin Mary, we joined the Virgin Mary parade at the cathedral and after about 3/4 hour of walking with this icon and the marching bands and people dressed in robes ,plus the beautiful ladies in their smart suits and Spanish headdresses and lace mantillas, we met up with the other parade of the same type but accompanying the Jesus icon. 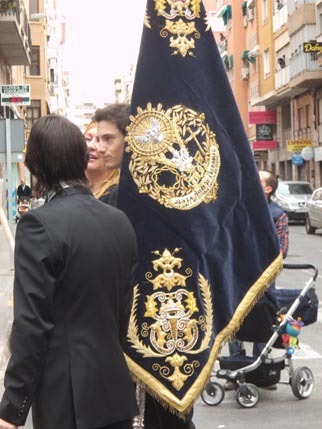 Once again there was amazing goldwork, both on the flags that were carried but also on Mary’s robes. 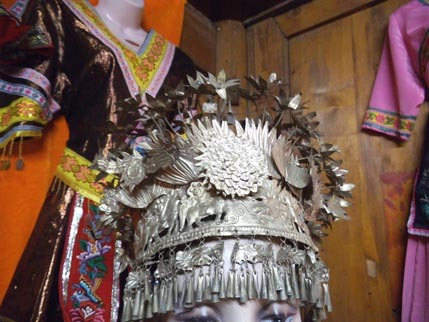 We have seen this icon before in the museum in the cathedral and her robes and crown are stunning. The accompanying groups, all dressed in matching satin robes of different colours depending on the group, were giving sweets to the children which seems to be a feature of Spanish parades, most of them I have seen involve sweets given or thrown into the audience which makes them very popular with the kids! 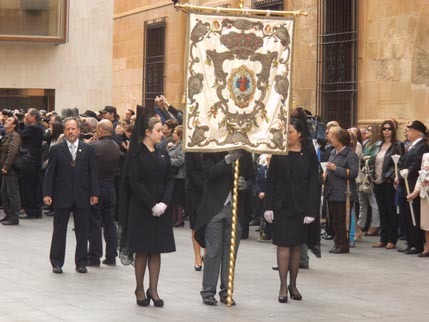 The unique feature of the Easter parade is that they also throw religious pictures, these are small prints usually of the icons and were thrown from the cathedral at the start and from many of the apartments on the route. 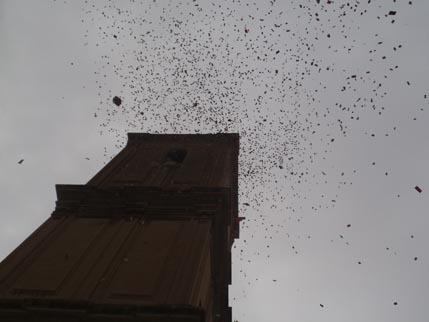 It was an amazing sight watching all these flutter down on the parade. 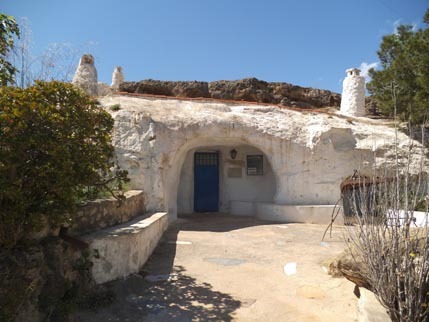 We also went to visit some cave houses near the town of Rojales again very near Mum’s – you can see the town from La Marina. 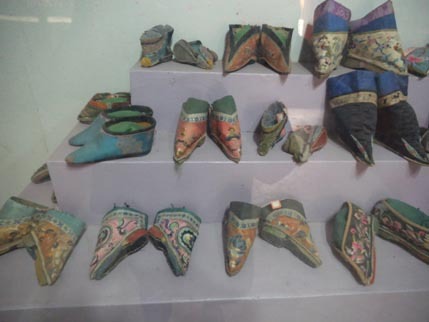 These are old houses that were once lived in but are now used for a range of artists from painting and ceramics to leather work. 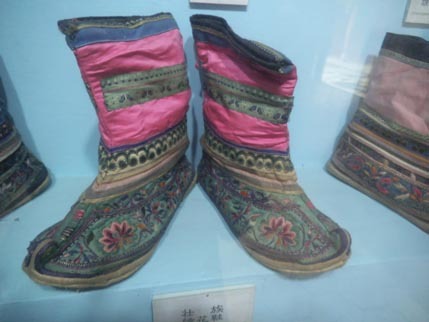 They were very cute and reminded me very much of the house in The Hobbit book and movie. There was also a cave bar, a wonderful little place with lots of little rooms and a beer garden with a fab view of the mountains so we stopped and had a red wine with a view. 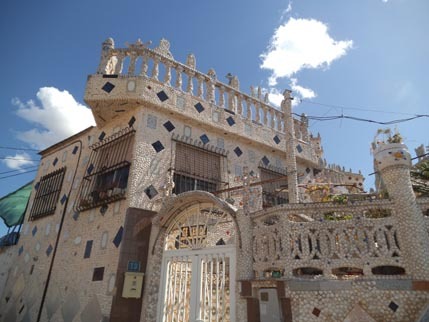 There was also this house just down the road from the cave houses that the owner has covered in shells and tiles, the place is the most amazing concoction involving bits that looks like a ship’s prow and others that look like castle battlements, all covered in tiny cockle shells and assorted tiles. 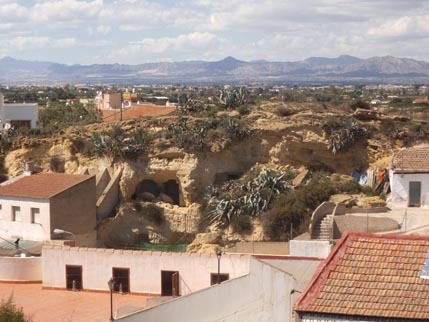 This is what I love about Spain, anywhere you go there is something a little bit bizarre but very interesting, it really is my kind of country! 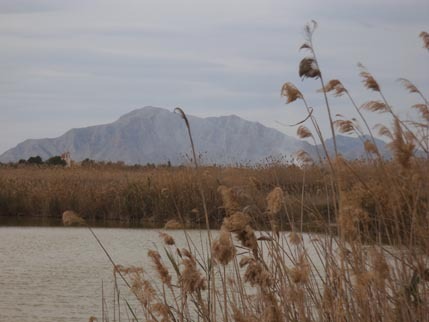 We also went for a couple of walks, this one was at a local nature reserve with a brilliant view of my mountains and lots of birds to look at – and we saw a snake in one of the lakes! 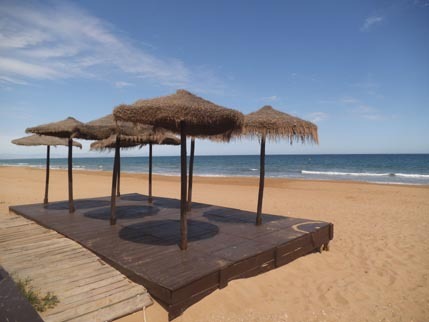 And this is from one of our beach walks – looks just like a really expensive Caribbean holiday doesn’t it? As always I had a lovely time and am really looking forward to going back in August. Hope you enjoyed the photos and thanks for visiting. Hope this finds you all well and happy. I have had a lovely time away in Spain with my Mum and have got some fab pics to post of the Easter celebrations there which I will sort for tomorrow. It has been a wonderfully sunny day today, I have two loads of washing dried on my line and this is in Yorkshire! 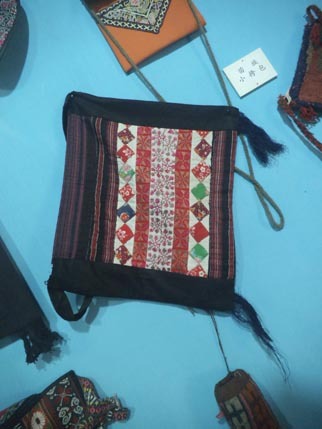 It is a miracle. We still have piles of unmelted snow though where we cleared the paths and the road, particularly on my side of the street as this does not get as much sun. It might be gone by May! 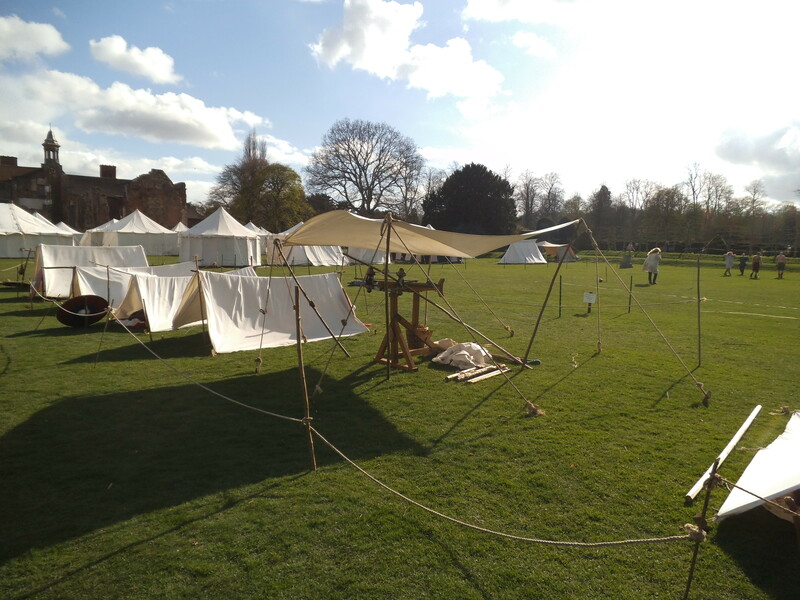 Hope this lovely weather continues as I have my first re-enactment event in 2 weeks time and my first camping weekend in 3 weeks – yippee!!! It seems appropriate to post a picture of the Winter ornament that I made for the Seasonal Exchange group since the theme of this piece was snowflakes. 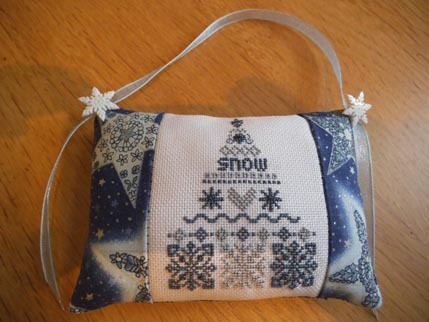 The design is a combination of a tree from the Cross Stitch mag from last year that I have made into a tree ornament for me and some snowflakes from the lovely Snow Poem design, once again stitched with Silk Mill thread. This piece is now with Lisa in Australia. 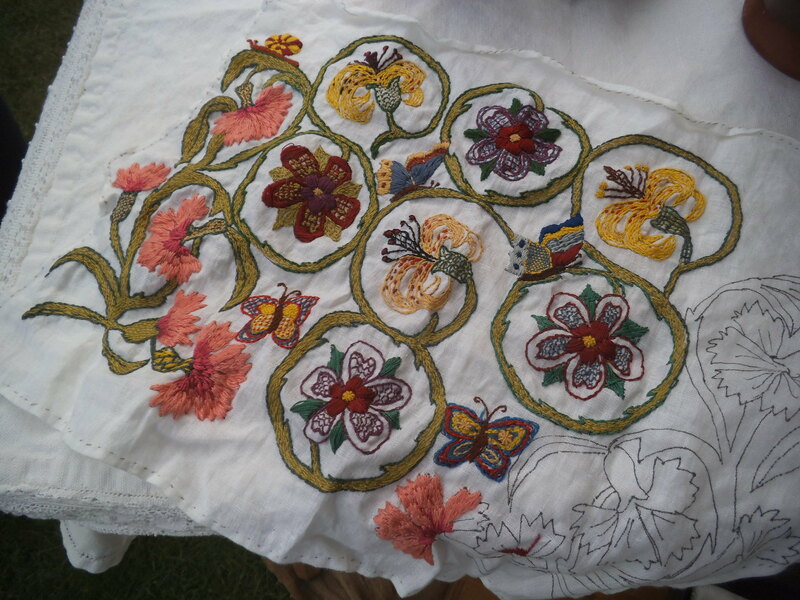 I am now stitching the Spring Exchange piece and also have been working on some new stock for my stall at Standedge, I found a cute pillow case today in my local charity shop so have been transforming that and some old jeans into a little handbag. 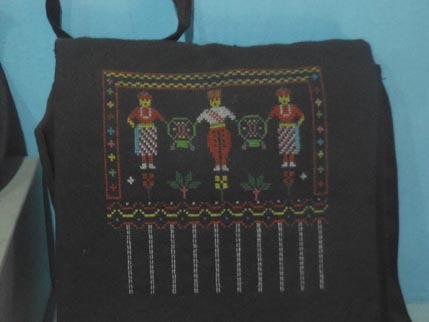 Will post again later this weekend, thanks for visiting.